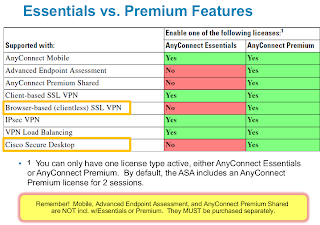 This post will try to help understand the differences between anyconnect premium and anyconnect essentials licenses. Note: You cannot have both Essentials and Premium running at once. Note: Cisco ASA 8.3+ no longer requires both the Active and Standby unit to each have a license. The active license is shared between the failover units. This should not be confused with the ‘shared premium license’. 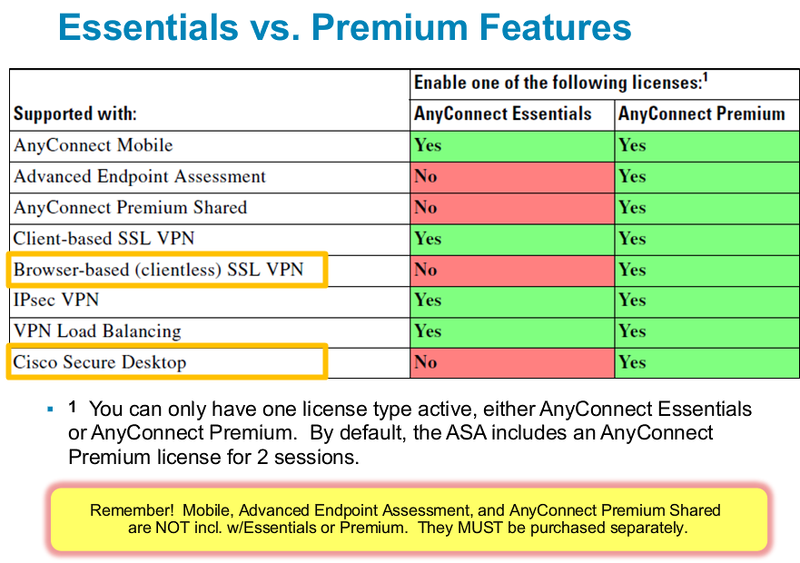 Source of this image: Cisco’s Partner Education center – ASA Licensing Webex. Purchase the license (L-ASA-AC-E-55xx= it costs $100-$500). Apply the license to the ASA using the ‘activation-key’ command. This does not require a reboot. You will now be licensed to accommodate 250 anyconnect connections. Buy the license. You must purchase a license for a specific number of users (L-ASA-SSL-10= costs around $800). If you’ve already licensed this ASA for Essentials in the past then it will still show as an enabled license. Then your ASA can have 10 Anyconnect users at once. Note: The name “Anyconnect Premium” has changed a lot in different versions. Here are the different naming schemes. This license allows AnyConnect connections from mobile devices. There is current support for iPhone, iPad, Android IceCream Sandwich, rooted Androids and Samsung Galaxy’s. The mobile license is on or off and not tied to a number of users. It costs between $100-$500. This license is applied by simply using the ‘activation-key’ command. A reboot is not needed. There is no further configuration needed after that. Advanced Endpoint Assessment includes all of the Endpoint Assessment features, and lets you configure an attempt to update noncompliant computers to meet version requirements. This license is applied by simply using the ‘activation-key’ command. A reboot is not needed. New to ASA 8.3+ code is the ability to share licensing. This is only for Anyconnect Premium. It allows for one ASA to have a shared license which other ASAs can use. This configuration requires two extra licenses. A license is needed for the shared server which indicates how many shared licenses there are and there also is a need for any participating ASAs. Now buy the shared premium license for the server for the amount of users you wish to have.